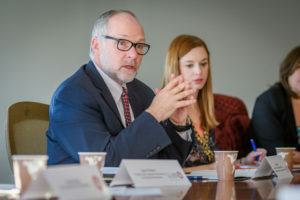 In an effort to prepare students to meet future workforce needs, health care talent executives and Clark University administrators discuss emerging trends in the health care sector. Health care and higher education can learn much from one another. Both industries are being disrupted by new technologies, rising prices, and an increasing need for collaborations. To thrive in their ever-evolving environments, hospitals and universities are learning to tackle these challenges with open minds. 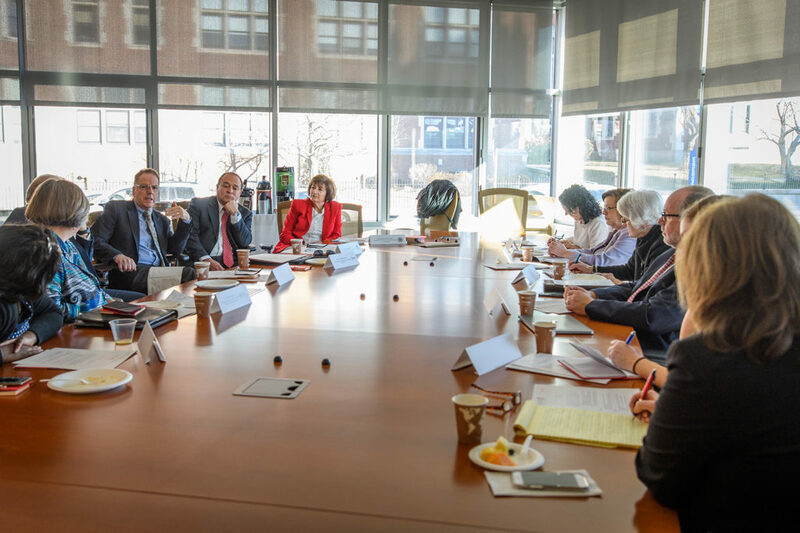 In light of this, Clark University hosted a Healthcare Sector Roundtable aimed to encourage cross-industry insights and forge innovative partnerships. On March 19, health care talent executives gathered alongside university administrators to discuss new and emerging trends affecting the health care workforce. Much of the discussion focused on developing talent outside of clinical areas within the health care sector, identifying and evaluating Clark’s academic assets to explore how to fill those talent gaps. In Worcester, the local economy hinges upon education and healthcare — the so-called “eds and meds” industries. According to the Bureau of Labor Statistics, there are currently over 68,000 jobs within the education and health services sector in Worcester County. As America’s aging baby boomer population demands medical care, the academic community seeks to build an increasingly skilled workforce. 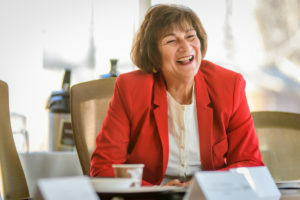 Matilde “Mattie” Castiel, Commissioner for Health and Human Services for the City of Worcester, discusses ways Clark can partner with the local community on preventative health projects. The panelists offered opinions on how to best align academic programming with growing employer needs. Many spoke about the difficulties of finding qualified health workers equipped with the skillsets in demand. Panelists identified several key areas of growth in the future of health care: data analytics and informatics, preventative medicine, and leadership development. The panelists noted the emerging need for workers skilled in data analytics and informatics since the translation of data into meaningful insights is critical to optimize efficiency, improve quality of patient care, and enhance health outcomes. They recommended students take coursework to develop their quantitative and writing skills, which health professionals need to analyze and communicate data. Participants also noted a mounting demand for telehealth — the use of technology to provide long-distance and mobile clinical care, education, and administration. The aging population will demand expanded homecare and telehealth options, prompting a new wave of job opportunities in this sector, they said. As the health care industry is transforming from a sick-care model to a well-care one, more emphasis is being placed on proactively educating the public about health and well-being. Clark has acted as a long-standing facilitator and champion of local community education and development. Panelists agreed that Clark students are known throughout the industry for their vision for helping the community — and that Clark should continue to foster this capacity. John G. LaBrie, dean of Clark University’s School of Professional Studies and associate provost for professional education, leads the discussion. With a large group of health care leaders set to retire in the coming decade, panelists agreed that developing leadership from within the health care ranks is a challenge. They suggested clinicians receive formal education to help them advance into leadership roles, and expressed interest in partnering with Clark to offer leadership development and management training. Panelists encouraged students to prepare for changes in the industry, especially as roles and responsibilities shift, recommending they be exposed to different facets of health care so they can adapt with confidence. Panelists urged students to pursue internship opportunities that will give them a broad range of skills and expose them to different areas within the field. Panelists included Matilde “Mattie” Castiel, commissioner for Health and Human Services, City of Worcester; Michael J. Paruta, chief human resources officer (CHRO) at Saint Vincent Hospital and CHRO Group Lead, Massachusetts and South Carolina Market, Tenet Health; Kimberly Napier, senior talent engagement consultant, Harvard Pilgrim Health Care; Paul D. Judd, vice president for human resources talent acquisition at UMass Memorial Health Care; Paul Heffernan, vice president of human resources, Heywood Healthcare; and Toni McGuire, president and chief executive officer, Edward M. Kennedy Community Health Center. The Healthcare Sector Roundtable is part of an ongoing effort by Clark University to engage local employers in efforts to ensure student success. A technology sector roundtable will be held this summer.